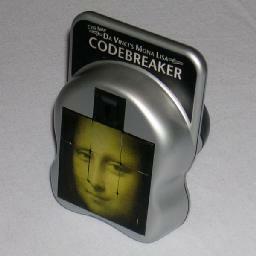 The (Mona Lisa) Code Breaker is a clever 3×3 variant on the sliding piece puzzle like the Fifteen puzzle. The top middle tile slides up into a recess, leaving the remaining 8 tiles free to slide about in a 3×3 square. On the back of the puzzle is a big knob which can be pushed in and rotated, and this lift out and rotates the tiles at the four corners of the square. In this way you can rotate 4 (or 3) tiles at a time. The mechanism for turning corners holds the 4 (or 3) tiles in a horizontal or vertical groove. Initially those four grooves are horizontal, which means that the corner tiles can only slide horizontally. Before you can slide them vertically, you need to give them all a quarter turn. When the puzzle was first released it had a picture on it of the face of the Mona Lisa, in order to take advantage of the popularity of the Da Vinci Code. There was also a version with numbers like a Sudoku. I was asked by Eureka Puzzles for a new design, and the arrangement of rings I came up with has been adopted for the current version of the puzzle, called the Twisting Rings Puzzle. This puzzle was invented by Dov Nesis, who also invented Virus, which can be seen on the Fifteen puzzle page. The Code Breaker's patent, US 2007/200292, was published August 30, 2007. Let's ignore the top middle piece, since it does not really take part in the puzzle. The other 8 movable pieces and the blank space have 9! permutations, but as with most sliding piece puzzles only half of these can actually be achieved. They can therefore be mixed in 9!/2 ways. Each of the 8 pieces can also be oriented independently of one another, in 4 ways. This gives a total of 48·9!/2 = 23,781,703,680. Note that if the direction of the grooves is also be considered part of the puzzle's position, then this number should be doubled. It can, however, be solved with the grooves in either direction. It is important to realise that if you move a tile into a corner spot, and then slide it out in the other direction (not back the way it came), then the tile must have been twisted a quarter turn. This means that if you want move a tile about without having to twist it, you must not let it go through a corner (or you have to do it an even number of times). In the description below I will assume you have basic familiarity with sliding piece puzzles such as the Fifteen puzzle, in that you should be able to bring any tile to any location. I will also assume that if you need to move a tile to or from a corner in the process, that you will twist the corners as necessary to put the grooves in the right direction for the tiles to move in the direction you want. Phase 1: Solve the bottom row. Find the tile that goes in the bottom left corner. If it is not oriented correctly, bring it to any corner, and twist it to its correct orientation. Slide the tile to the bottom middle position without twisting it, i.e. without it entering any corners. Move the tile leftwards into the corner. From now on, that tile will not be moved again except that it will often be temporarily twisted. Find the tile that goes in the bottom right corner. If it is not oriented correctly, bring it to any corner (not the bottom left of course), and twist it to its correct orientation. Slide the tile to the bottom middle position without twisting it, i.e. without it entering any corners. As you do so, also make sure that the tile belonging at the bottom middle does not lie in the bottom right corner. Find the tile that belongs at the middle of the bottom row. If it is not oriented correctly, bring it to one of the top corners, and twist it to its correct orientation. Slide the tile to the centre position without twisting it, i.e. without it entering any corners. Without disturbing the three tiles, bring the space around to the bottom right corner. Orient the bottom left tile, and then slide the other two tiles into place. Phase 2: Solve the right column. Find the tile that belongs at the right of the middle row. Slide the tile to the right middle position without twisting it. Find the tile that belongs at the top right corner. Make sure that this tile does not lie in the centre location, and also that the blank space lies in the middle of the top row. 3. and then the centre tile to the right. If the tile belonging at the right corner it not oriented correctly, bring it to the top left corner, and twist it to its correct orientation. Slide the tile to the centre position without twisting it, and with the space at the middle of the top row. 4. and finally a tile towards the right into its correct position in the corner. Phase 3: Solve the last three tiles. Cycle the three tiles at the top left until they are in their correct locations. If this is not possible (exactly one is correct, the other two need to be swapped) then some of the previously solved pieces are actually incorrect. 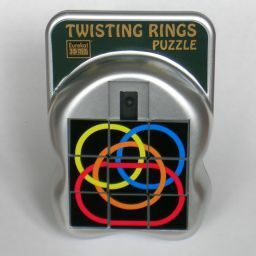 On the Twisting Rings puzzle this means that you need to swap the two identical tiles at the bottom corners, and start again almost from the beginning. Make sure the other corners are correctly oriented, and then count how many of the tiles need to be twisted a quarter turn (ignore those that need a half turn). If 1 or 3 of the tiles need a quarter turn, then cycle the three tiles around until they are back in their correct locations. All three tiles will have travelled through the corner and so they will all have been given a quarter turn, leaving only 0 or 2 tiles that still need a quarter turn. 1. Cycle the left three tiles to bring one of the tiles that need to be twisted into the centre, with the space above or below it. 2. Cycle the three right hand side tiles around until they are back where they started. This gives a quarter twist to the centre tile (as well as the other two tiles on the right). 3. Cycle the left three tiles to bring the other tile that needs twisting into the centre. 4. Cycle the three right hand side tiles around until they are back where they started. This again gives a quarter twist to the centre tile, and restores the two tiles on the right. 5. Cycle the left hand side tiles around until they are in the correct locations, undoing the cycles in step 1 and 3. 1. Bring the tile to a location next to a corner, with the space at the corner. 2. Slide the tile into the corner. 3. Twist it 180 degrees. 4. Slide the tile back again. 5. Undo any moves you did in step 1. Do this for any twisted tiles and the puzzle should be solved.